The July 2013 issue of Cycling Active magazine goes on sale from Wednesday, May 22 and as ever it’s ram-packed with bike reviews, product tests, real-world fitness advice, great places to ride and a whole lot more healthy goodness. If you’ve entered the London to Brighton bike ride on June 16, and the thought of 54 miles to the coast is giving you palpitations, fear not. Our last-minute tips to get you safe and smiling to a well-deserved ice cream on Brighton’s Madeira Drive is in the July issue. But really, you only have to get a few basic things right to enjoy a day out on the bike. And being fit enough is quite far down the list of priorities. The priorities are being comfortable in the saddle and pre-servicing your bike. Get those things right and your little steed will be the most helpful of companions. Let our London to Brighton guide ease your day on what is one of Britain’s greatest rides. Plus, we present our usual comprehensive selection of bike tests, with models from Trek, Genesis, B’Twin, Frog, Brompton and Roux all reviewed. And we round-up the best bib-shorts, sunglasses and summer tyres. Struggling with your weight? Think your riding technique could improve? Let our experts lend a hand with friendly advice that yields real results. And we take rides in Wiltshire, Wakefield, Scotland and New Zealand, presenting some fantastic places to go and explore. 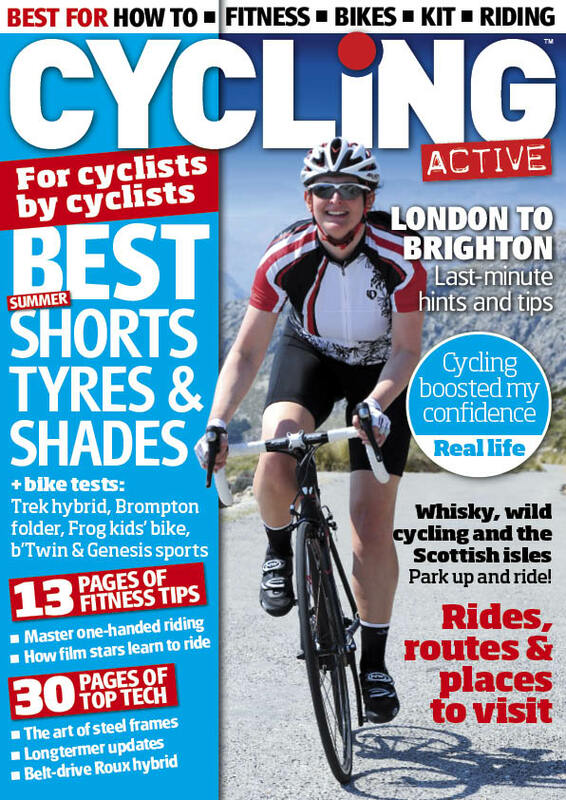 Cycling Active July 2013 issue is on sale from Wednesday, May 22, at WHSmith, major supermarkets and all good newsagents priced £3.99. Calendar: The events season is in full flow, time to get going!